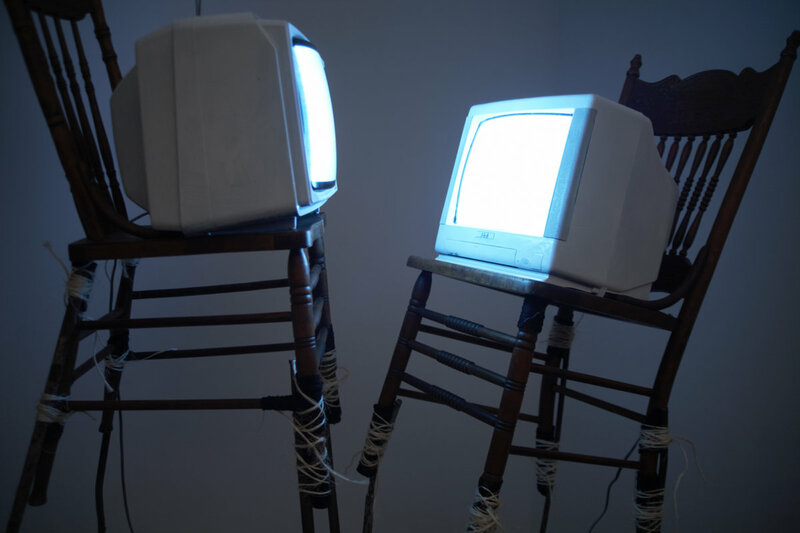 muted btwn us addresses ideas surrounding the decay of communication/ conversation between two individuals crossed over a hyper-real space such as the cell phone, internet, skype etc. The absence of body is re-constructed into a cyborg presence that is manufactured by found objects bound and stacked together. This totem of elements is headed by two televisions. The videos displayed are distinguished by their gender; female on the lower chair and male on the higher chair. 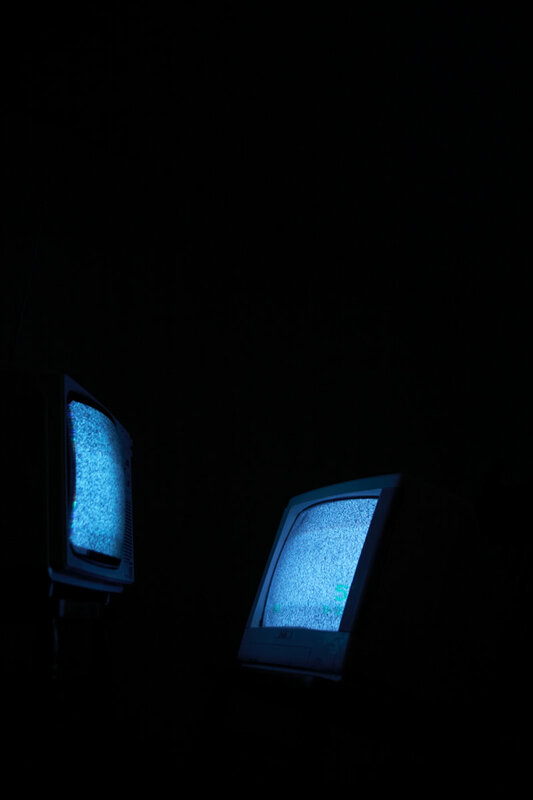 Fleshed out from the discord of loss signal patterns and white noise screened on the TVs are instances of a male mouth and a female eye. The mouth is muted but repetitively tries to speak to the female eye that responds with only subtle emotional shifts, nothing to confirm understanding. Each video is roughly a minute long but not precisely, this allows an asynchronous harmony between the two videos switching between white noise, bar tone and image a few additional seconds off beat of each other and will only play in-sync with each other once every hour. A square frame is positioned on the floor. Within this marked space a white pedestal is built. 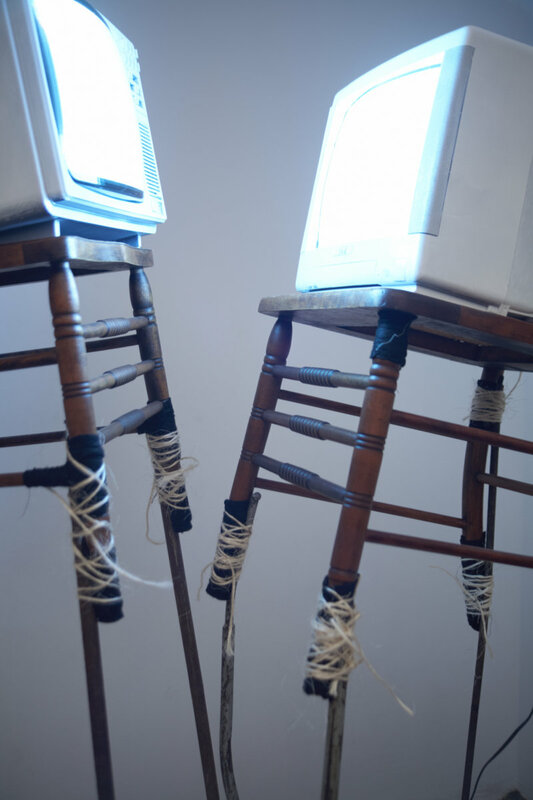 Balanced precariously on this pedestal are two post-colonial antique chairs roughly bound to bent and twisted metal stilts. 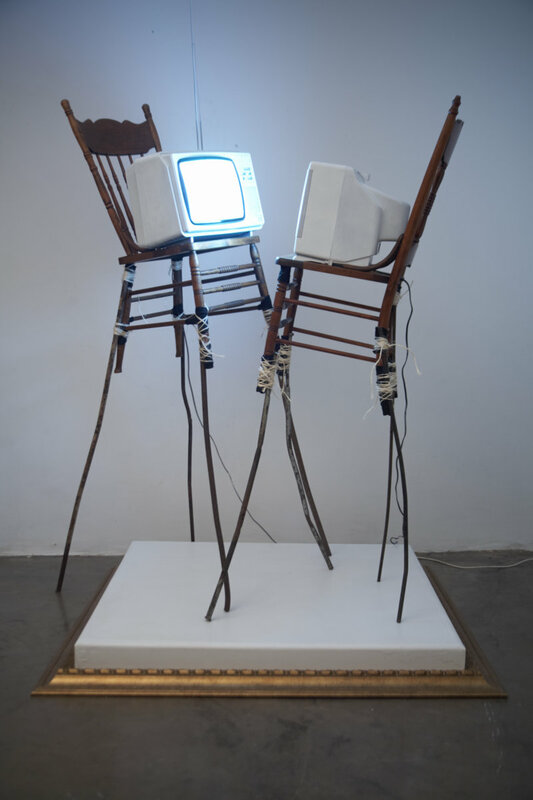 Sitting on each chair is a television painted white to disfigure it from its iconic status in contemporary culture. What is focused on here is rather the videos playing on the screens. - Reviewed on STD Bank ‘New Talent’ website, 2009.